Jon Stewart and Stephen Colbert Attempt to Outdo Glenn Beck in Upcoming "Rally to Restore Sanity" and "March to Keep Fear Alive"
In an attempt to mock Glenn Beck, Jon Stewart and Stephen Colbert are holding dueling rallies in Washington, D.C. on October 30th, 3 days before the midterm elections. 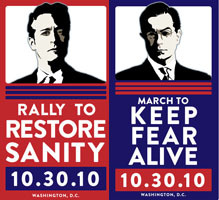 Jon Stewart's rally is called "Rally to Restore Sanity" and Stephen Colbert's rally is called "March to Keep Fear Alive." It looks like these two can't stand that Glenn Beck and the Tea Party movement have been taking the spotlight. Do they really think they'll have as successful of a rally as Glenn Beck?